Now that Spectacles can be purchased online, avid snappers will no doubt have lots of questions about the fashion-forward eye candy, so let’s not waste time. Well, it goes without saying, you will need an iOS or Android phone running Snapchat in order to use Spectacles. If you aren’t already a Snapchat user or you find it confusing, we don’t think Spectacles will change that outlook. However, there are other things to keep in mind. Spectacles isn’t one-size-fits-all. If Spectacles feel small/tight on the face, Snap says this can be adjusted by an optician, but be careful: applying heat or water to where the electronics are (in the front of the frame) may fry them. If Spectacles feel loose, Snap suggests tightening the screw of each temple – where the arm joins the lens frame. Unfortunately, there’s no way to try them before you buy. If you decide you don’t like Spectacles after you receive one, Snap offers a 30-day return policy, provided you have a receipt and your pair isn’t damaged or altered. You can also exchange for a new pair if you encounter any problems that you can’t troubleshoot. If you wear prescription glasses, you can swap out the Spectacles lenses for ones that match your prescription. An optician needs to do this for you. 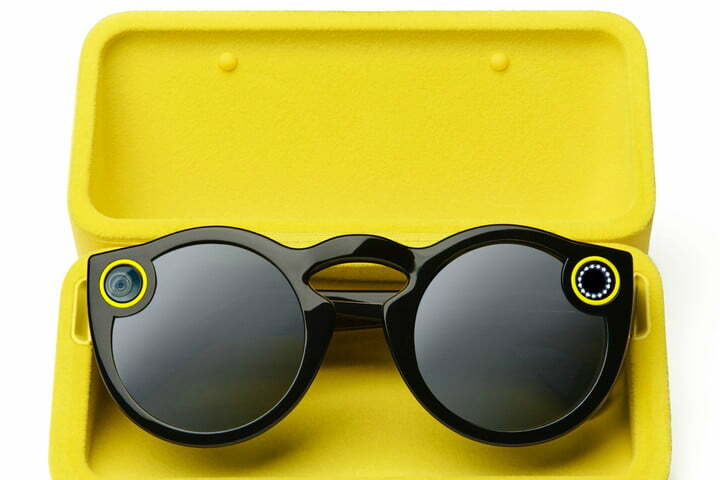 The Spectacles comes inside a magnetically-sealed, wedge-shaped case in Snap’s trademark yellow. For a glasses case it is somewhat large and hefty – you probably wouldn’t want to carry it around in your coat pocket. It’s made of a soft material that should protect the Spectacles in case of accidental drops. Inside, you’ll also fine a USB charging cord. The case also doubles as a portable charging cradle. When seated inside the case, contact points at the joint of the Spectacles’ left arm (when folded) connect magnetically. One end of the cord ($10 for a replacement) is then connected to the case, while the other end has a standard USB connector for plugging into a computer, portable battery, or wall charger. The cord can also connect directly to the Spectacles, eliminating the need to use the case. Once the cord is attached and charging, you will see LEDs light up. Snap recommends using a USB wall charger, however, there isn’t one included. Inside the case is a built-in battery that can be used for on-the-go, standalone recharging. When fully charged, the case can recharge a pair of Spectacles up to four times. Without the case, it takes approximately 90 minutes to fully charge a pair of Spectacles using a wall outlet, according to Snap. To see how much juice is left, double-tapping on the side of the left arm (where the shutter button is) will light up a number of LEDs that correspond to the percentage of battery life left. You can also find battery info via the Spectacles menu in the Snapchat app. Snap says the Spectacles’ battery should last a day or 100 snaps on a single charge (one Snap is considered one 10-second video), but we’ve seen reports that indicate battery life is much shorter. If you use the Spectacles often, you may want to bring along the case. Unlike regular sunglasses, Spectacles requires extra care. Do not use one in water. Would you buy this new technology?